→How To Run With Bronchitis Without Getting Sick ? ​How does bronchitis affect your routines ? ​When Do You Need An Advice ? How long does bronchitis last ? Bronchitis is described as a condition wherein the airways from the trachea to the lungs are infected. This infection is viral and contracted by exposure to someone with a cold. When it comes to the effect bronchitis has on exercise, there is no reliable answer. The degree to which your condition affects your running depends greatly on the duration of your sickness and the severity of the condition. Some people can get over their bronchitis in a week without experiencing lowered performance while others take longer. Others, on the other hand, experience physical symptoms such as shortness of breath during exercise. Take a personalized approach and try to understand how bronchitis affects you individually. Bronchitis can be either acute or chronic. Acute bronchitis is the condition wherein the symptoms can last for weeks, but the effect of the illness isn't that profound. Chronic bronchitis, on the other hand, keeps coming back and usually affects your physical activities. 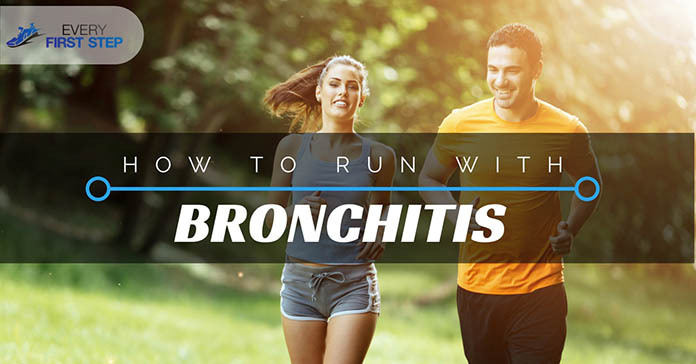 In order to determine how bronchitis will affect your running, you first need to identify which kind of bronchitis you have﻿. If you are determined to continue running with bronchitis, one important thing that will greatly help is if you identify the risk factors. This way, even if you are running, you can stay away from triggers that may make your condition worse or in﻿﻿crease the risk of you having a breakout. If you experience a pain in your heart when you run, you may have a more serious lung condition called pneumothorax or a collapsed lung. This happens when air enters the space between the chest and the lungs and when you inhale, the pressure builds up causing the lung to collapse. Additional symptoms of this serious lung problem include shortness of breath,fatigue, chest lightness, nasal flaring and fatigue. Air pollutants. These include carbon monoxide, nitrogen dioxide, sulfur dioxide, particulate matter and anything else that can trigger a negative reaction in your lungs. Allergies. This may include dust, pollen, and other potential allergens. If your cough is more than three weeks old and you are experiencing serious symptoms such as a painful chest. If you also have the fever, shortness of breath and a rapid heart rate, you need to consult a doctor immediately. If you have been diagnosed with acute bronchitis, exercise will not make your condition worse. However, since acute bronchitis causes an inflammation of your airways, they become more irritable. When you run with such a condition, coughing may easily be triggered. However, you may still consider running as long as you slow down when you start having trouble breathing. Since running may stir up coughing, you need to be very careful not to exert too much effort. If you have already rested for a few days and are feeling better, you may decide to try getting back to your running routine. Use a mouth cover if you are running in cold weather. This helps keep the air you breathe warm, so your airways don’t constrict. Initially, only run for 3-4 miles instead of getting back to your regular routine. If you are a smoker, this is also a very dangerous habit that can be the cause of your bronchitis. Smoking also greatly lowers your performance and can create a lack of oxygen which triggers shortness of breath. Reduced endurance due to lack of oxygen supply is another negative effect from smoking. You will also experience a lack of energy. For these reasons, it is best that you take decisive steps to quit the habit as soon as possible. The worst things you can do if you decide to run with bronchitis is push yourself too much and make your condition worst. No matter how much you want to return to your regular running routine, never risk the condition progressing into something more serious. Gladly, bronchitis is typically mild and goes away within a few weeks. IF you have a strong immune system, you may be able to resume your regular exercise within a few days. For some people, however, the symptoms persist for longer periods of time. Even when you are cured, you may still feel some sensitivity in your airways for up to two months. This case, be willing to lower the intensity of your workout until your airways are totally back to normal. Until then, don't push yourself but instead, learn to listen to your body and be willing to lay back for a while until your body recovers. Bronchitis is not as serious as it may sound and should not be a big hindrance to your running. Although this is the case, many factors can make the condition worse such as pollutants, allergens and the like. The best way to combat bronchitis is first to get yourself diagnosed and then follow the treatment prescribed. Once you do this, you can identify how to safely get back to running without causing havoc on your body. The secret to running with bronchitis is taking it one step at a time, starting with a low-intensity workout and slowly increasing it until you reach your goal. If you follow these steps, you will be back to your regular running schedule in no time! How did you like this article? Have you ever tried running with bronchitis or some other respiratory disease? We’d love to hear your thoughts in the comments below. Please also share this article with other runners and help spread the word.